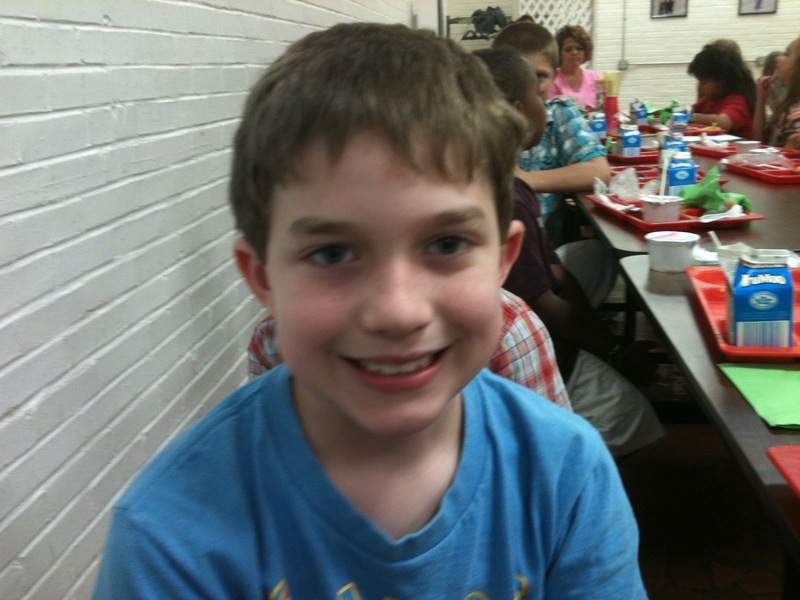 Today is D-bug's 8th birthday. It's hard for me to believe that eight years ago our sweet boy was born. We prayed for two years for a child, and God blessed us with this beautiful, noisy, messy, OCD, eccentric, charming, funny and perfect-for-us little boy. 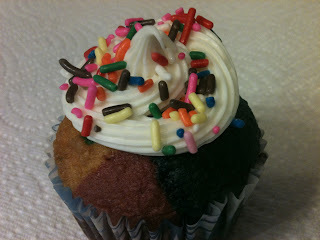 Last week, I made the cutest cupcakes to share with D-bug's 2nd grade class. 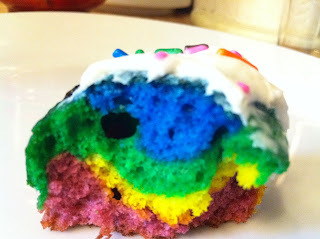 I based these from the Rainbow Tie-Dye Cupcakes recipe from the "Can You Stay For Dinner?" blog. Forgive the not-so-stellar pictures from my phone ... my photog skills are definitely a work in progress. For these little babies, I used a white box cake mix, white frosting, Wilton gel food coloring, and sprinkles for an extra "pop." The Wilton colors I used were kelly green, royal blue, orange and lemon yellow. I also used liquid red and blue food coloring to make the purple, but I recommend using gel food coloring to get brighter colors. 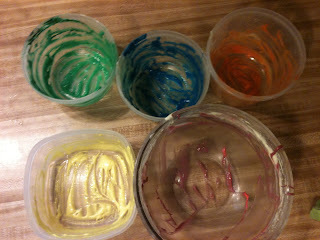 Make the cake mix per the box instructions and then separate the batter into separate bowls (one for each color you use). Add a little bit of the gel coloring to the batter (I used the tip of a butter knife to add the coloring) and then mix the color into the batter using as few strokes as possible ... if you mix it too much, you will overwork the gluten in the batter and the cupcakes will have a bread-like texture. Unfortunately, I forgot to take a pic of this step, but here's a lovely snap of the empty bowls. Drop a small spoonful of each color into each cupcake liner, repeating for each color, until the liners are 3/4 full. Pretty, aren't they? Kinda looks like something you'd find at Willy Wonka's place. 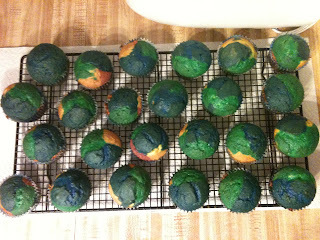 Bake the cupcakes per the box instructions and allow them to cool completely. Once cool, slap some white frosting on these little gems. No need to color the frosting ... you want the rainbows to speak for themselves. Add some sprinkles for that little "sumthin sumthin" extra. Serve and watch the smiles appear as the rainbows disappear. 1. 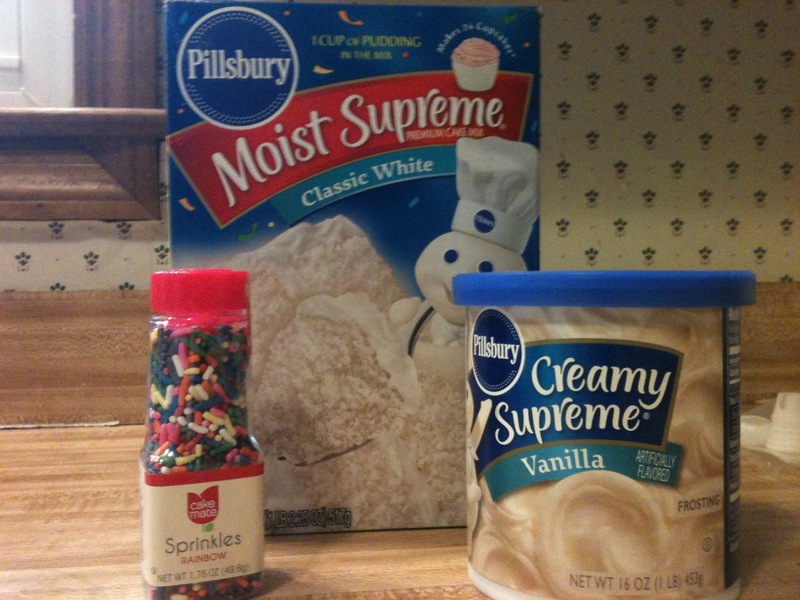 Preheat oven and prepare cake batter per box instructions. 2. Separate the batter into separate bowls, one for each color. 3. 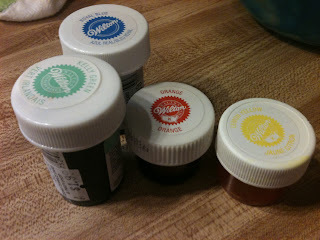 Add one color to each bowl and mix just enough to work color through batter. 4. 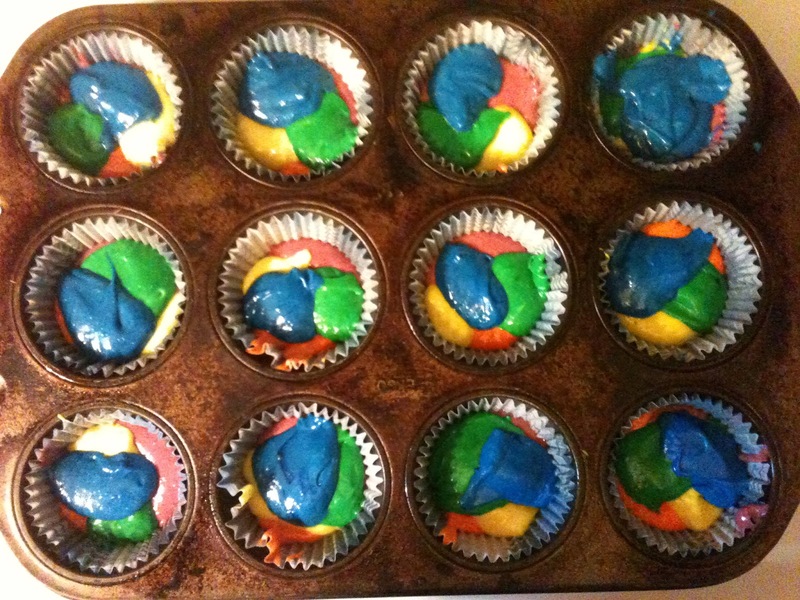 Drop a small spoonful of each color into each cupcake liner, repeating for each color, until the liners are 3/4 full. 5. Bake cupcakes per box instructions and allow to cool completely. 6. Frost cupcakes with white frosting and top with sprinkles. So cute! I made these many moons ago for my daughter...so fun! Thanks! And I love that you can change the colors for different holidays and events.